Is this the end of everything you were? A burst of light, a hurried, fractious blur. Fond memories that you wish could reoccur. We marked this loss as your divine birthright. And chase away the darkness with new light. 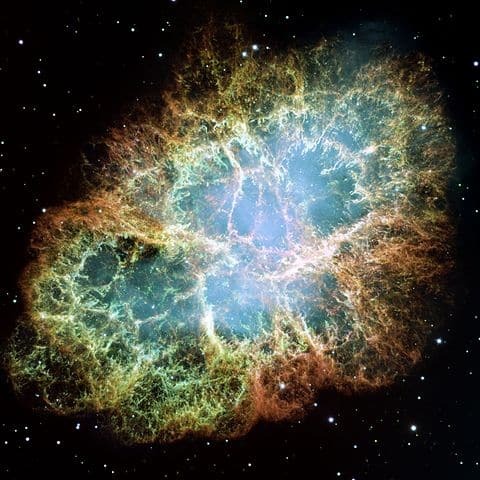 Image taken by NASA’s Hubble Space Telescope of the Crab Nebula, a six-light-year-wide expanding remnant of a star’s supernova explosion (Photo Credit: NASA, ESA, J. Hester and A. Loll Arizona State University). This is a Rondeau, inspired by recent research which has identified a star that refuses to shop shining, and which has exploded multiple times over a period of at least 50 years. A supernova is the explosive death of a star, which unleashes a burst of light through the universe. Not all stars become supernovae, and only those with a mass between 8 and 50 times that of our sun will experience such a fate. During this process, the star runs out of nuclear fuel, which causes some of its mass to flow into its core. Eventually, the core become so heavy that it cannot withstand its own gravitational force, causing it to collapse and resulting in the giant explosion of a supernova. Every supernova previously observed has been assumed to be the final point of no return for such stars. However, the researchers in this study have found new evidence that challenges this assumption. When supernovae iPTF14hls was discovered in September 2014 it looked like an ordinary supernova. However, several months later it was observed to have first faded and then grown brighter. This strange observation prompted the researchers to check their archival data, and in doing so they were astonished to find evidence of a supernovae occurring in the same location in 1954, i.e. from the same star. One possible explanation for this occurrence (the so-called “Pulsational Pair Instability” theory) was that the star was so massive and hot that it generated antimatter in its core, which would cause the star to become violently unstable, and could result in repeated bright eruptions over a number of years. However, the energy released by supernovae iPTF14hls is more than the current theory predicts, suggesting that this supernova may be something entirely new, and as such researchers continue to monitor it, in search of possible answers.